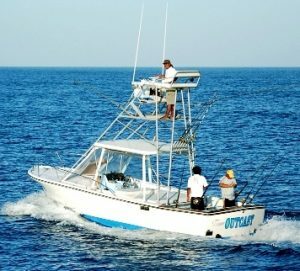 This 27ft Dusky powered by twin 250HP Cummins diesels is one of the top small boats in Tamarindo and all of Guanacaste in the North Pacific. Bilingual Captain Arturo Rosales, who has fished the area since the 1990s, is at the helm, with mate Yordy. The boat, which can take up to four anglers, has an 11.5-foot beam, tower, fighting chair, spacious and shaded seating area and roomy cabin with marine head. It carries GPS, depth sounder, outriggers and a full range of Penn International and Shimano tackle.